I mean, the one blog idea I was going to keep up with was 52 Lists. I love making lists. It's not that hard. It's simple. So, what is my problem? Not even to List #10, and I have fallen by the wayside. Oops. Well, I'm just going to catch up real quick! I think this is where I went wrong. I thought, seriously? What a boring list! I think I'll skip this week! Then I skipped another week & another. So. I don't have much to say about spring cleaning. Because I don't really clean as much as I should. I definitely wouldn't be winning any housekeeper of the month awards, I'll tell you that. Then, I organized two things around my house that had been bugging me. And I thought, HEY! Maybe I DO occasionally do a little bit of cleaning. Ha. I also dusted the nasty house. I would really like to plant some pretty flowers out front, but I have yet to do that. I have no green thumb. And kneeling for hours while planting things just doesn't sound like my idea of fun. But maybe I will make that happen. Anyway, the gift wrap situation was out of control. I had all of it in one of those under-the-bed bins. Whenever I needed to wrap something, it would be forever digging through that thing. Or not. It drove me nuts. 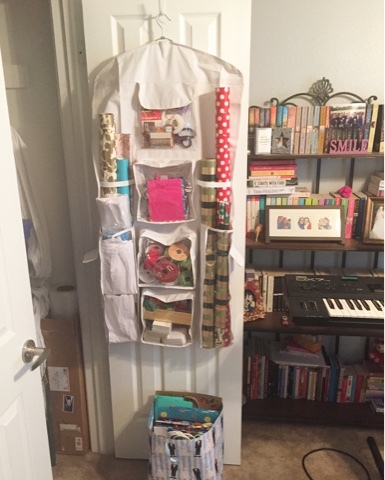 I ended up buying one of those over the door organizers and got it all under control. It didn't have a place for gift bags, so I just organized them by theme, and put them in a larger bag. I told Brad, I shouldn't have to buy another gift bag for a very long time. I have been buying them, but unnecessarily, as I have birthday, baby, wedding, and Christmas bags in there! The other recent organizing I did was inspired by a picture in a magazine I got in the mail. 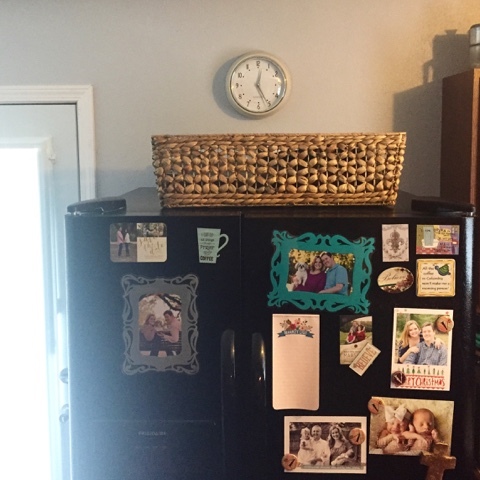 It had a nice basket on top of the fridge, and immediately I knew what I needed to do with the clutter on top of our fridge. I picked up the basket at Home Goods, and wah-lah! Mandy & Billy's couch! Haha! Um... that's all I got. Can I rename this to "Things i want someone to make for me"? Please? Because I am not crafty, and I don't like making things. I want to pay someone to make these things for me. Except the photo books. I can handle that. Oooh yes... a good pen is def an essential.